Engineering Solutions Offer You That The Best Tower Design National is a very fast growing and diversified manufacturing and marketing group dealing with hi - tech engineering products lines. National Cooling Towers enjoys a significant presence in Cooling Towers industry. 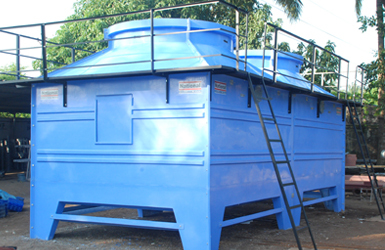 We have supplied our Cooling Towers to nearly 5000 Organizations from medium size units to corporate companies. Our product is the complete solution to process water-cooling by way of designing of cooling towers as per your needs in the following range. We design the FRP Induced Draft and Timber Cooling Towers considering the Indian climatic condition using ulkersons Method and CTI Acceptance Test Code for calculating air horse power require and dimensional sizing format to dissipate heat load (kcal) generated in the Cooling Towers.